Still doing your Yuletide shopping and want to get things by mail order or online, but prefer to buy from independent suppliers rather than big businesses? 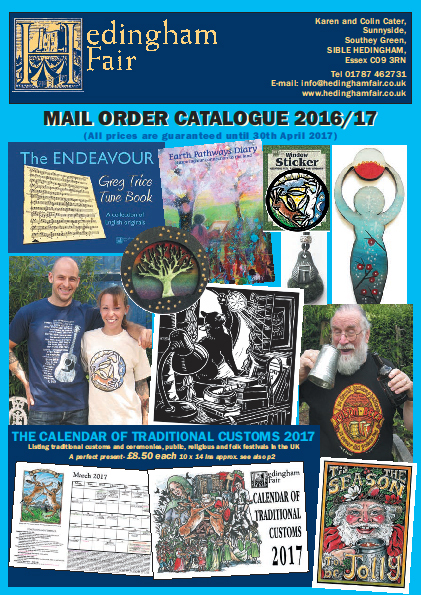 If so, Hedingham Fair has a beautiful range of things to look at, including its 2017 Calendar of Traditional Customs. Although we are very close to the holidays, the post is apparently getting through quite quickly, so that anything posted on 19th (or even 20th) is likely to arrive before the holiday weekend. So, for that last-minute Yule present, why not go to www.hedinghamfair.co.uk - for T-shirts, jewellery, plaques, cards and books. All orders are dispatched within 24 hours.